I’ve requested a cause to be created on Social Vibe. Please visit and join the discussion. The Canadian Seal Hunt will soon begin again this winter. Each year, Canadian sealers charge their boats into the snowy territories in Northern Canada with clubs and shotguns in hand, ready for blood. Canada claims that this is necessary as it brings jobs and economical prosperity to the regions, yet many believe this explanation is unfounded. Each year, over 250,000 baby harp seals are slaughtered on the ice, for their skin and white fur. Barely 3 weeks old, they will be torn from their mothers, shot or clubbed on the head to death, while many, still alive and screaming in agony, skinned for their furs, a horrific murder scene on the pristine, beautiful snow tainted in red.There has been a public outcry against such unspeakable acts of cruelty. European countries have already banned Canadian food from import in 2009, and this will get even more attention this year. Please boycott Canadian goods and learn more about this issue and spread the word, sign as many petitions to help legislators bring an end to this. Thank you. Below is from the Care 2 petition site – please take a moment and go to this link and sign the petition against this mass killing. It is no different than what they are doing over in China, where they spread false fears about diseases to citizens. Instead of euthanising the animals, they should help as many adopted as possible. 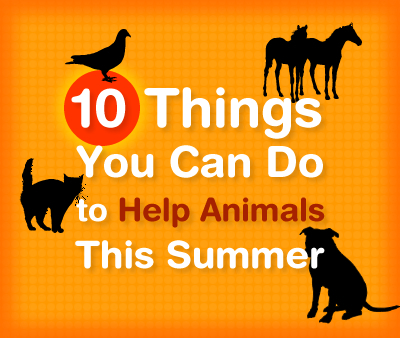 I’ve gathered 10 items from various sources with suggestions on how you can help the animal causes this month. They are all easy to do and some will feel really rewarding. Small steps – big leap for animals! 1. Write to corporations and governments that practice or support puppy mills (including your local pet shop selling puppies), factory farming, and other abuse you feel passionate about. 3. Meet people like you anywhere like online communities, who advocate for animals – share ideas and debate. Go to Causecast.org and learn more, or social sites like Humane Society Network. 4. Volunteer at your local animal shelter or the ASCPA, in New York City/Brooklyn, a great one that needs a lot of help is BARC Shelter in the Dumbo district. You will help walk dogs around the park, bring a friend. 5. Scout out 3 animal welfare organizations that fit your cause, and donate $25, $50 or whatever you feel comfortable with to each organization. You would be surprised how much good a little money can do. My favorites are Defenders of Wildlife, Humane Society of the United States, International Fund For Animals. Local shelthers like the Northshore Animal League is no-kill, and Bide-a-Wee in NYC as well as BARC in Brooklyn. 6. Start a blog about animals, whether it’s just about the pure love of your favorite animal, breed. Or get even more active with a welfare blog. Make taking pictures this summer fun by starting a photo blog of the dogs and cats you see in your neighborhood. 7. Go to a local dog park, and enjoy a nice summer day. Appreciate the simplicities of life. 8. Attend a show at Cirque Du Soleil, a non-animal circus. They are amazing and far more entertaining than watching elephants get whipped into a standing position. See their show listings and schedule here. 9. Adopt a cat or dog at your local shelter. If you can, adopt one from a kill-shelter, as you can save lives, especially an adult who has a lesser chance of getting a loving home, or a cat with one eye who suffered abuse. They deserve your love. Go to Petfinder.com and browse the thousands of animals. 10. Decide on an animal welfare topic most close to your heart, and make a simple flyer (don’t forget to include instructions on what they can do to make a difference) and pass it out at a farmer’s market, dog park, supermarkets, etc. This one takes a little bit of guts – I’ve done it once on the subject of Veal Cows – you will get positive encouragement from people, or some people just don’t care, but that’s how you start something important! Right now as I write this post, China’s government for fear of a few random cases of rabies death, has ordered a massive killing of more than 30,000 dogs. Dog Death Squads and civilizians alike take to the streets with bats, iron bars, sticks and rocks, chasing poor dogs, mercilessly beating them to death. Many of these dogs were claimed to also be health family pets. One by one, the dogs are “pulled out with a pair of long metal tongs, and brutally beaten with a stick – then even some may still seem to be alive, they’re tossed into a pit to be burned” – via International Fund For Animals. China’s massive animal killing spree is nothing new. During the Olympics, they rounded up over half a million cats off the streets and brought them to be gassed, boiled, killed in mass. Each instance an epidemic of disease occur, the Chinese blame the animals first and out of fear, instead of learning about what can be done, resort to immediate killing of these poor animals. Friends, right now, dead dogs lie and fill the streets of this village, and many more at one point or another in China’s history. Please spread the word. Don’t just read this post — Donate to this critical cause or WRITE TO THE CHINESE GOVERNMENT and express your outrage. Thank you. According the the WSPA, in some countries, armed dog control officers randomly shoot dogs in crowded streets. If not killed instantly, the dogs end up wounded and left to die. They are shot at, drowned, hung, and electrocuted and there are far more cruel ways to exterminate unwanted animals. In countries ravaged by war, famine and olitical upheaval, animal suffer equally if not worse. This is not the way to control animal population; it is ineffective and the numbers increase around the world, prompting more unnecessarily killings in the first place. Please help stop the bloodshed. With your help, animal welfare organizations will provide mobile clinics and medical attention to homeless dogs and cats in rural communites. Please do your part and make a donation and spread the world. Thank you! This year marks a significant chapter in American history, as President Obama takes over our country, we hope that he will bring positive change in so many critical issues we are facing today. On my wishlist, of course, is global warming and its impact on our environment and the wildlife that live within. It will not be an easy feat, however, I am hopeful. This year, I will continue to fulfill my duty to bring the most pressing issues about animals, both local and international to my blog. I’d like to do my part in bringing more awareness about animal cruelty to the world. Starting right now, please do your part of good by helping to bring an end to the Canadian annual baby seal hunt. Each year, hundreds of thousands of baby harp seals are slaughtered on the ice fields off Canada’s east coast for their pelts. Over 95% of the seals killed during this hunt are just days or weeks old. Visit StoptheSealHunt.org to learn more, watch the video, and join the cause. It is a heartbreaking thing and if you already know what this is all about, you are not alone in feeling like you must do something about it. Animal cruelty is truly a global issue. Take for instance, in the Middle East and possibly elsewhere in third worlds, the medieval sport of bear baiting is a typical entertainment. As a bear cub, it suffers the trauma of capture and his teeth and claws yanked out. Grown into adulthood, the bear is dragged into the ring each day and chained with a metal hook to its nose permanently, he defends himself with merely his own weight against a pack of dogs tearing into their flesh. Both bear and dogs fighting to the death. This is gruesome, cruel, and senseless. This is not that different from animal circuses in modern countries, where animals suffer at the hands of reckless and irresponsible trainers, except here the entertainment intentionally ends in animal deaths. Please help today by going to the WSPA (World Society For the Protection of Animals) site and learn more and perhaps make a donation. Even as we are worlds away from the countries that practice such inhumane entertainment, our voices will be heard. You count- really. Speak out now at this link which gets sent directly to your local government and stop the assault on the most important law enacted on behalf of wildlife of this earth. Thank you! This is not a favoritism for PETA, however they bring to our attention that while China is celebrating a beloved world event, the Olympics, dogs and cats continue to suffer at the hands of this industrious nation. Fur is bad, especially when they are taken from these feeling, intelligent domestic animals. China is way behind on human rights, and that leaves no place for animals. They are behind in effective and humane animal control (they just don’t care enough to try – spay /neuter/educate), instead they irradicate dogs and cats like vermin. They horrifically stripping their fur while the animals still alive, and falsely label on coats and jackets as “faux furs” to be sold in Western nations. Please help in sharing with friends and family. If you feel generous, donate to welfare groups fighting this cruelty, or simple SIGN THE PLEGE at this link. The more we speak the more power we will yield for issues we care about. Only within days of my previous post about the endangered wolves, I see this horrible news. “Soon after Alaska’s Board of Game approved the killing of all wolves in an area near Cold Bay, state officials illegally killed 14 wolf pups after gunning down their mothers — yet another grisly chapter in the Alaska’s out-of-control wolf slaughter,” reported by Defenders of Wildlife. Alaskan state wildlife personel illegally chased down a pack of 14 adult wolves by helicopter, shooting them from the air. They say this is to help boost caribou population which is neither sensible nor humane. Later, they raided a den of 14 puppies, now orphaned with their mothers and fathers killed just hours before. These puppies were prompted executed. Alaskans are now moving to end the Board of Game’s barbaric aerial hunting of wolves through a ballot measure. Wealthy interest groups like the Safari Club International are using their powers to defeat this ballot measure. Alaskans for Wildlife, along with Defenders of Wildlife, is desperately trying to raise $80,000 in effort to raise public awareness in order to end the hunting of these magnificent wolves. Please help by spreading the word, or donating Defenders of Wildlife for more information. I just donated $100. 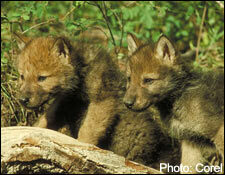 Small price to pay to help save wolves.